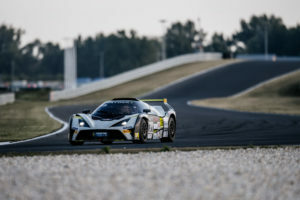 Friday morning at the Slovakia ring was an early start for the Reiter Engineering teams with scrutineering and driver sign-on scheduled shortly before the race weekend’s first session, Free Practice 1. With all the admin work done, it was finally time to get the car out on the track. FP1 revealed a few gremlins in the set-up, the biggest being a significant amount of understeer. The post-session debrief led to setup adjustments to improve the handling prior to FP2. During the afternoon’s session, the car’s balance had improved; however, some further fine-tuning was called for to get it just right. The engineers were confident that this would produce a car that would give the best performance for our Czech drivers. Saturday morning came with rising track temperatures and whispers of rain spreading throughout the paddock. Fortunately, we had a dry qualifying session on our hands. The team were in high spirits after successful free practice sessions, and with improvements to the set-up; qualification was soon to commence at 9:45 a.m. Qualifying 1 started with Erik Janiš behind the wheel. Improving lap times saw him creep higher and higher up the leader-board until Erik secured pole position for Race 1 by posting a time of 2:11.113, just before a red flag stopped the session. This ultimately turned out to be the fastest lap of the weekend. 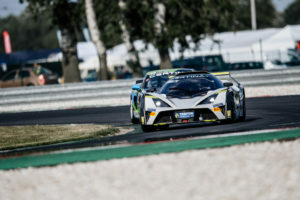 Qualifying 2 started after a 10-minute interval, with Josef Záruba steering Team Kiska into 6th position for Race 2 with a time of 2:11.796. Just 55 thousands of a second behind #54 of Team Pankl driven by August Macbeth. It seemed like the sun was shining on the Reiter Paddock with the KTM X-Bows dominating the font of the grid and Team Kiska leading from the helm for Race 1. Unfortunately, the talented and the hardworking sometimes don’t get appreciated for their efforts, as we later discovered. 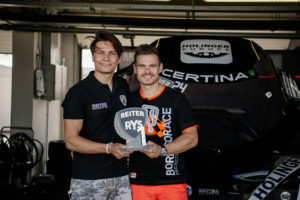 The enthusiasm and pride amongst the Reiter camp was soon crushed by a decision taken by the stewards to disqualify all times posted during Q1 and Q2, for all eight KTMs due to high wheel camber readings. This controversial decision was later found to be incorrect due to damaged equipment used by the stewards in measuring the camber; read more about this in the Reiter Engineering official race report here. Ultimately this meant that all the Reiter Young Stars had to start from the back of the grid for Race 1 and Race 2. After parc fermé opened for the cars, the KTM XBOW Balance of Performance (BOP) was changed with only 1 hour and 40 minutes to go until the start of Race 1. Any large set-up changes were discouraged as safety checks took priority before the cars were rolled out for Race 1. It would be a struggle to complete the set-up changes in this time, especially with all Reiter cars requiring reprogramming so as to be BOP compliant. With Race 1 starting at 5:30 p.m. Team Kiska lined up on the grid in P23 behind Franjo Kovac in the Porsche Cayman. Erik Janiš was first in the car, climbing his way up the grid until ‘box box box’ was called by our race engineer Steve Chege. Our driver change practice sessions certainly paid off; with a time of just over 32 seconds for the driver change, Josef Záruba was ready and waiting in the car for the all clear sign by our race engineer Joanne Mitchell. Josef continued to climb to score a point by finishing P10, the highest KTM finisher in Race 1. Unfortunately, due to the limited time available for the BOP changes, our Reiter engineers could not complete the reprogramming for the cars in time for Race 1, leading to all eight KTM’s being disqualified. It seemed like the weekend could not get any worse, although it wasn’t getting any better either as our cars were retained in parc fermé overnight as all other competitors were released a few hours after Race 1. This ended up being an early night since there is little a race-team can do without a race-car. With fingers crossed for better luck in the morning, the team headed home for some well-deserved rest. Sunday morning came with #34, along with 5 other KTM X-Bows, still in parc fermé. It was approximately 45 minutes before Race 2 when the cars were released. This is when the team effort from the mechanics, engineers and Reiter staff kicked in. All eight cars went out to the grid well within the time for the start of the race with RYS Team Kiska lining up on P25 on the grid. Unfortunately our luck had run out when a collision on the exit of the first corner of the first lap with #94 RYS Team Racecom, meant that both Team Kiska and Team Racecom had to retire from the race. However there was some light at the end of the tunnel. Despite all the hardship and trouble, our colleagues RYS Team KTM climbed from 23rd on the grid to P1 with a 0.66 sec lead over RN Vision STS. 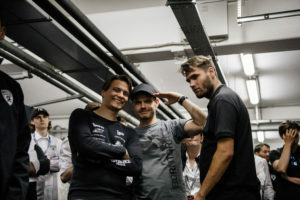 Despite all the odds Eike Angermayr and Reinhard Kofler pushed until the very end, making the Reiter camp extremely proud of the hard work everyone had put in that weekend. Sadly, sometimes politics gets in the way of pure talent, ambition, hard-work and determination. Despite this, Reiter left with a victory from Slovakia Ring, in what must have been; one of the most challenging race weekends experienced in the Reiter Young Stars. Our next event will be at the famous circuit of Zandvoort on the 19th and 20th of August. Where, hopefully the RYS teams will have better luck; with no prejudice or race result manipulation. 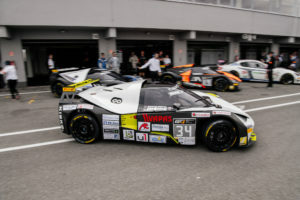 RYS Team Kiska will be back stronger than ever to make up for the point deficit from Slovakia Ring. Make sure you get your tickets here for what will be, an extremely exciting weekend.